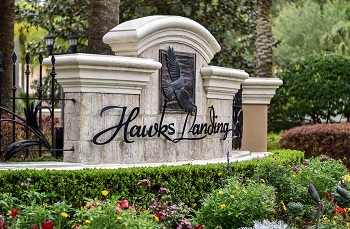 Hawks Landing of Ridgemoor in Palm Harbor is a private, gated and secluded community surrounded by acres of natural conservation area that offers a private sanctuary with city convenience. Located in the most desirable section of northern Pinellas County, off Ridgemoor Blvd from East Lake Road, a Hawks Landing newer luxury home is a Parade of Homes Grand Award Winner! The lavish landscaping of the one and two story impressive homes is impeccably maintained throughout the neighborhood. Homes have approximately 3400 to roughly 6700 sq. ft., containing three, four and five bedrooms and from two to five baths. Most homes have three car garages, fireplaces and in-ground caged and heated pools with many custom designs and upgrades. The subdivision offers easy access to Lake Tarpon, the beautiful Florida gulf beaches and Brooker Creek Preserve. Just a short commute to shopping, entertainment and airports. Ridgemoor is a large community with many subdivisions in all price ranges. If you are looking for an upscale contemporary home, Hawks Landing needs to be seen! Let us show you around Ridgemoor and its many interior subdivisions today. Selling your home in Hawks Landing? Do you want your home sold quickly and at the highest possible price point? If so, our talented and qualified agents at Lipply Real Estate can work with you to achieve this goal - all you have to do is set up an appointment either through our site or with the contact form below!